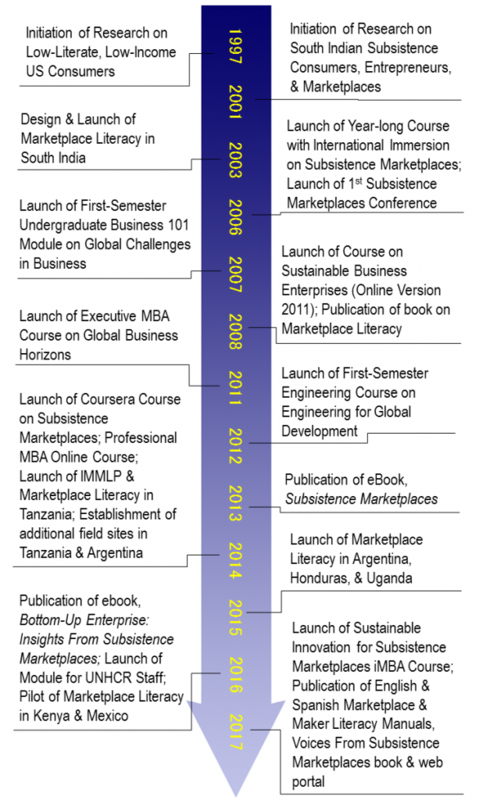 The Subsistence Marketplaces Initiative (SMI), in the College of Business at the University of Illinois, has pioneered a bottom-up approach to research and practice at the intersection of poverty and marketplaces. Our efforts in research have generated more than 40 authored publications, and we have edited roughly 60 refereed publications through special issues and organized six biennial conferences bringing together scholars and practitioners. Direct educational experiences, derived from our experiences on this topic, reach almost a thousand students a year at the University of Illinois and many more students online, including a yearlong interdisciplinary course and a one-of-a-kind international immersion experience that has been ranked one of the top 10 entrepreneurship courses by Inc. Magazine. Educational materials are disseminated worldwide through a web portal. This work has led to a unique marketplace literacy educational program that approximately 100,000 individuals have received in seven countries – India, USA, Tanzania, Uganda, Argentina, Honduras, and Mexico through the Marketplace Literacy Project, a non-profit organization founded in concert with this initiative and other partners. SMI seeks to develop and disseminate actionable knowledge for creating sustainable solutions for subsistence marketplaces. The radically different context of subsistence and the emphasis on sustainable solutions provides a very challenging setting for research, education, and practice in management. Our work connects subsistence and sustainability, and the lessons learned are likely to be useful in all contexts to collectively face the challenges that confront humanity. Unique to our approach is a bottom-up orientation that begins with a micro-level understanding of buyers, sellers, and subsistence marketplaces. We adopt a marketplace rather than a market orientation, viewing subsistence contexts as more than markets to sell to, rather as individuals, communities, and preexisting marketplaces to learn from. Our focus should be distinguished from macro-level economic approaches, and mid-level business strategy approaches such as base-of-the-pyramid (BOP) research. Our goal is to understand and enable the progress from subsistence marketplaces to sustainable marketplaces, i.e., marketplaces characterized by sustainable production and consumption that enhance individual and community welfare and conserve natural resources. Our work on subsistence marketplaces over the course of more than a decade and a half has created unique synergies between research, teaching, and social initiatives. In all three arenas, our work involves engagement of students, businesses, and social enterprises as well as a diverse set of faculty and campus entities across different disciplines. We have also created forums to connect a community of researchers and practitioners and enable outlets for publication. We describe our initiatives in the rest of this website. The history of our project is shown in the following timeline.